What The HECK Is Content Curation Anyway?? I often speak of Content Curation and I was having a bit of a discussion about it today. One of my friends was like WT Hellzz Anise, what are you talking about. Then I thought about how much that phrase is thrown about within the social media circles and wondered how many people may not know what we are talking about. I guess I just assumed and you know what they say about assuming. 😀 Then I thought long and hard about curation, its relationship to content and the Internet. One of the things about the Internet is the abundance of information that is available. During the initial growth of the Internet, this was amazing because we were not use to having access to so much unfiltered information. To an information and knowledge junkie like myself, this was just information heaven and beyond awesome. However as time grew so did the Internet and with the continued growth of the Internet the amount of available information grew along with it. Sharing of this vast amount of information became extremely popular due to the growth of Social Media sites like Facebook and Twitter. So now what was once enjoyment of the large amounts of information to many has just become overwhelming in its vastness. 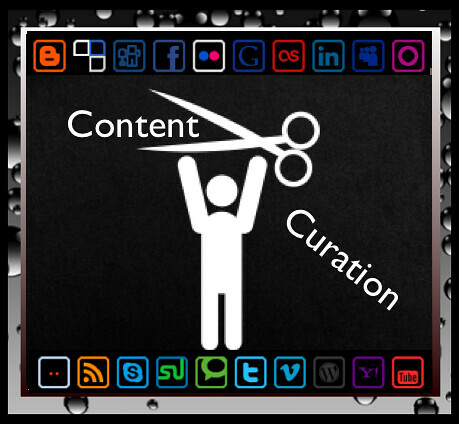 This is where content curation comes it it allows the curator to take all of the information that we are bombarded with, compile and share it with followers. Content Curation is really a bit of an Art because it allows the curator to strategically weed through the noise, focus on great content and share it with those that will find it most useful. I am currently in a contest about content curation and I thrilled to say that I am a semi-finalist as a Top Curator. Take a look at my curated topics below and start curating yourself if you have not done so yet. I have found Scoopit to be the best curation tool for my needs, but there are others. If you like the content that I am curating Please Vote!